Do you want to know the best recipe for keto bread? If so, you are in the right place. We offer the best recipe for keto bread on the Internet. There are other tasty recipes, but this one, this is perfection. And that is not all; the best part about this recipe is that it’s simple and easy. When on a low carb diet or simply wanting to have the best option of bread this is the ideal thing. By having this bread at disposal at any time, you won’t make a mistake. See this recipe and make the bread today. You will be grateful you made it at the first bite. This recipe has one secret step that makes this bread great, and that is the separation of the eggs. You will need to separate the whites and the yolks. Why is that? Well, we are going to whip the whites until they get fluffy. Remember, we want soft peaks since they will volume to the keto bread which is otherwise dense. Beating the whites is the answer to the denseness which occurs by making bread with almond flour. Usually, the problem with making baked goods with almond flour is that the finished products are too dense. The solution here is the fluffy egg whites with the baking powder. They get the loaf nice and fluffy, and it is definitely better tasting. You can use this bread the same way you will use actual bread. 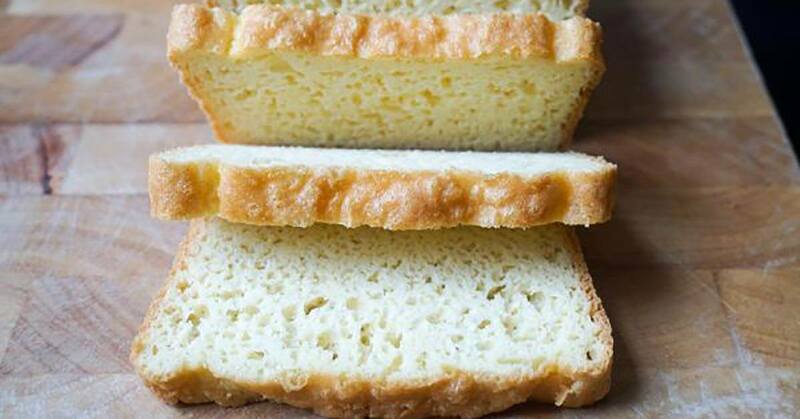 With this specific keto bread, you can do avocado toast, french toast, croutons, sandwiches. You can do it all! The possibilities are endless, that is which makes it the best keto bread on the Internet. With this specific bread, you will find it easier to follow a low carb diet. For many people, bread was a staple while on a diet. Or seeing the bread basket at family dinner was always a struggle, notto overeat. This bread is the solution and your shoulder to cry on. The best replacement possible. #1 How do I eliminate the egg taste? Most people love the mild egg taste in this recipe, but there are some who don’t. If you turn out to be one of them, do not worry, because we can fix this. #2 Can I replace almond flour with coconut flour? There is another recipe with coconut flour. It’s ideal for those who hate almonds or have nut allergies. #3 How to store this bread? The best way to store the entire loaf in the fridge, you can put it in a ziplock bag or a Tupperware container. You should cut off slices as you eat it. If you store your bread that way, it will last from 7 to 10 days. #4 How to make your loaf fluffier and taller? Two things can cause a flat loaf, and that is not whipping the whites or using almond meal instead of ground almond flour. If you are doing everything by the book and still things do not work, you should opt for a larger recipe. You can make 1.5x this recipe, and you will get a much larger loaf. First, you should preheat the oven to 375. Then you should separate the yolks from the whites. Then take the whites and in them add the cream of tartar. Beat until you achieve soft peaks. Take a food processor and combine 1/3 of the beaten egg whites, yolks, almond flour, melted butter, salt, baking powder. (and optional liquid stevia) You should mix until it’s combined. Until the whites are added, it will be a thick lumpy dough. Add the remaining of the egg whites and process it until completely incorporated. Make sure not to overmix since this will give the bread its volume. Take a buttered 8×4 loaf pan and add the mixture. Bake for half an hour. Take a toothpick and use it to check if the bread is cooked through. Once ready all you need to do is enjoy it! Bear in mind that you should take 20 slices out of the loaf.